Home / News / Why Cows? If you’ve been following the Institute for long, then you’ve probably heard plenty of cow references. You might even be one of the lucky few to have one of our 90th anniversary herd for your very own (pictured above). You may also have asked yourself at some point why a social science institute would be so bovine-obsessed. The answer actually goes all the way back to our first director & namesake, Howard Washington Odum, who founded the Institute in 1924 after arriving at UNC-Chapel Hill in 1920 to head the sociology department. Odum grew up in Bethlehem, Georgia, on a small family farm. His father, William P. Odum, maintained a herd of pure bred Jersey dairy cows. William passed his passion for breeding cattle on to his sons Howard and Henry, who continued the tradition and eventually passed it on to their children as well. Howard W. Odum operated a Georgia farm with his brother Henry remotely for approximately twenty years before establishing his own in 1933 on University Lake Road in Chapel Hill. Though the herd he maintained was fairly small – never numbering more than 30 or 40 milking animals at a time – its impact on the region was huge. Odum’s line breeding program was meticulously planned to combine the best genes from the bulls and dams with the best pedigrees, in order to essentially create a line of super-cows. These super-cows would not be “super” purely based on their production yields, but also on overall health, heartiness, and resistance to disease. The heartiness factor was something that was hindering the South’s dairy industry at that time. Though most cattle could deal with the heat, the humidity on top of it was seriously affecting production levels in the region. The cross-breeding championed by Odum helped create cows that could stand the climate by pairing those that had already managed to flourish in it. Disease resistance both due to breeding and improved medicinal options also increased, and as a result the Jersey cows that Odum so carefully manufactured produced better quality milk at two to three times the rate of other cows in the Carolinas. Odum became very well-known in the Jersey cattle community. 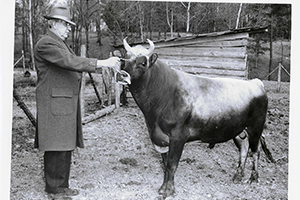 He won the prestigious title of Master Breeder from the American Jersey Cattle Association, was the first to be named to the American Jersey Cattle Club’s “Constructive Breeders Registry” for three consecutive years, and was elected president of the North Carolina Jersey Cattlemen’s Association during World War II. Beyond that his herd and individual bulls and dams won countless other awards. For more information on Odum and the history of the Institute, please click here. J., J. “Chapel Hill Chaff.” Chapel Hill Weekly [Chapel Hill] 15 Nov. 1955: n. pag. Print. “Odum’s Prize Bulls.” Greensboro Daily News 6 July 1942: n. pag. Print. “Dr. Odum – Master Breeder.” Jersey Bulletin 25 Mar. 1949: n. pag. Print. “Jersey Cattle Club Honors Dr. Howard Odum.” Daily Tar Heel [Chapel Hill] 18 Feb. 1939: n. pag. Print. Vance, Rupert B. “Odum, Howard Washington.” NCPedia. State Library of North Carolina; NC Natural and Cultural Resources; NC LIVE; Institute of Museum and Library Services, 1 Jan. 1991. Web. 12 July 2017.